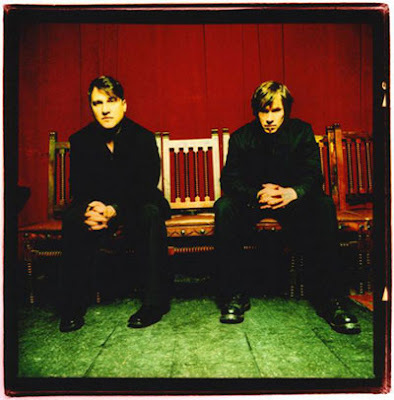 The Gutter Twins is a side project of Greg Dulli (ex-Afghan Whigs, current member of Twilight Singers) and Mark Lanegan (ex-Screaming Trees, ex-Queens Of The Stone Age). On Christmas Day 2003, the guys began work on their collaboration. It took a few years for all the timing to fall into place. Their long awaited debut, Saturnalia, was just released a few weeks back. It definetely has a dark, bluesy feel to it. It features guest appearances by Joseph Arthur, Martina Topley-Bird, Queens Of The Stone Age's Troy Van Leeuwen and the touring band of the Twilight Singers. The Gutter Twins will be here on Wednesday at Antone's. Ticket info for the Austin show is down below, along with the rest of the tour dates. They recently appeared on Letterman with the song "Idle Hands". He really seemed to enjoy it, check out his reaction at the end of the video.